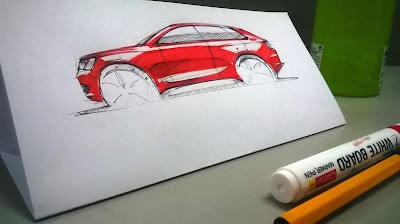 Dealing directly with clients is fun :D But, sometimes when things get boring and redundant every week, one loses the excitement :( So, during one such call with a client, I started sketching a car though I sketch lot of things these days. Currently, I am trying to make myself better with women potraits :D and human illustrations. Anyway, so during this call, I sketched with pen and coloured it with the only colouring tool available at my desk, a board marker. This car is my favourite sketch that I did at Infy Bangalore. There are stories which don't end positively, Promises To Keep is one of them. The poem meets the light when out of the tunnel...This one is in continuation of Promises To Keep, one of my favourite works. Without counting what I Attained. I tackled the weather and the ruthless Terrain. With a desire to reap the fruit that was Seeded. Hopes in vain and in the drain are Endeavours. But, she is not there to witness and Receive. Couldn't confess my love, all I'm left is to Weep. Time gave a slap that was so Tight. Fell on the heart and agony was High.